Anna Hierta-Retzius was one of the leading philanthropists of the 1800s and also a pioneer of the women’s movement. Anna Hierta-Retzius grew up in Stockholm, the city she lived in throughout her life. Her father was the well-known liberal, politician, businessman, and publicist Lars Johan Hierta, who founded Aftonbladet, amongst other things. Her mother, who hailed from Gothenburg, was Wilhelmina Fröding, the daughter of a wholesale merchant. Anna Hierta-Retzius’ parents’ marriage was a business arrangement and her mother brought a significant dowry to the household. Her father, who lacked financial resources, used his wife’s wealth to establish what, at that time, was financially an extremely successful business. The couple had five daughters in quick succession: Anna Hierta-Retzius, Hedvig, Bertha, Clara, and Ebba. It was a great disappointment to them that they did not have a son. Lars Johan Hierta also had two illegitimate children, a daughter and a son. The daughter – Carin Wikström – was born shortly after he married Wilhelmina Fröding and was brought up within the family as a foster-child. The son – Edward Faustman – who was the result of Lars Johan Hierta’s relationship with the journalist  (Wendela Hebbe), also sometimes lived at home with the family as a foster-child. Anna Hierta-Retzius’ and her sisters’ childhoods were marked by their father’s extra-marital affairs. Part of this included being moved out into the more rural Södermalm in order to get away from Wendela Hebbe’s menage. Anna Hierta-Retzius’ sisters Bertha, Clara, and Ebba were married off when they were young, whilst Anna Hierta-Retzius did not get married until she was 35 years old. Her husband was the doctor and race biologist Gustaf Retzius. Lars Johan Hierta generated significant wealth throughout his life and by the time of his death in 1872 he was one of the richest men in Sweden. His daughters were able to lead very comfortable lives thanks to their inheritances. Wilhelmina Hierta bought a large property on Drottninggatan where Anna Hierta-Rietzius lived from the autumn of 1886 until her death in 1924. For a while her sisters Hedvig and Ebba Lind af Hageby lived in the same building. Much to Anna Hierta-Retzius’ sorrow she and her husband had no children. Following the death of their father the surviving children set up the Lars Hiertas Minne trust and the financial income from it played an important role in Anna Hierta-Retzius’ official income. She also used her own means to support projects which she felt were important. During her childhood Anna Hierta-Retzius was exposed to two areas which came to influence her life, namely philanthropy and the women’s movement. At that time it was the norm for young, bourgeois women to become involved in religiously motivated charitable work. Her mother introduced her daughters to such activities and Anna Hierta-Retzius and her sister Ebba Lind af Hageby were each given a poor home in Klara parish which became their personal charitable case. Both of these women would later set up charitable organisations which would, in turn, serve as precursors to modern welfare institutions. Her father would entertain the most important liberal politicians and cultural celebrities of the era at the family home, and thus his daughters were exposed to progressive ideas, including those regarding female emancipation and efforts to reform the social standing of unmarried women. Lars Hierta’s associates set up Lärokurs för fruntimmer (women’s courses), a significant development in regard to advanced education for women. From 1859-1861 Anna Hierta-Retzius herself was involved in this and through it she got to know other women who came to play a central role within the bourgeois women’s movement. Her father introduced her to  (Fredrika Bremer) and  (Ellen Key), whom she later worked with for a while. Anna Hierta-Retzius set up and ran several philanthropic organisations. When she was 25 she founded the Torsdagsskola in Klara parish, which was aimed at young working-class girls who had completed vocational school. They learned to read, write, and undertook practical studies such as knitting and sewing. The school also had a lending library and a savings bank, intended to teach the women how to save money and plan for the future. In 1881 she founded a cookery school for working-class girls, who were also taught house-keeping skills. The school also trained house-keeping teachers and later was transformed into Stockholms skolkök. Perhaps the most important organisation founded by Anna Hierta-Retzius was the ‘arbetsstuga’ (afterschool centre) for schoolchildren. She had been inspired by ideas from outside Sweden. The first arbetsstuga was established in Adolf Fredrik parish in 1887, followed by one in Katarina parish in 1888, and later they became established nationwide. They provided afternoon activities for children as well as a meal and instruction in handicrafts. The arbetsstuga can be seen as a precursor to modern after-school centres. In 1870 she also, along with her sister Lind af Hageby, established a charitable organisation called Bikupan, aimed at middle-class women who lacked financial support. This in turn served as inspiration for the creation of Handarbetets Vänner (friends of handicrafts association). Bikupan was a shop which sold handicrafts anonymously created by women. Anna Hierta-Retzius was a wealthy woman with considerable shares in companies set up by her father. She made use of her shares in order to improve workers’ conditions by introducing pensions and building proper housing for them. Those companies which were based in Södermalm in Stockholm and employed female workers offered welfare contributions for unmarried women. For many years the she financially supported the Södra Kristliga förening av unga kvinnor (KFUK) (Södra Christian young women’s association), which assisted female workers within industries such as Liljeholmens Stearinfabrik AB, Barnängens Bomullsspinneri, and the tobacco factories as part of its remit. The association offered leisure activities, lunches, courses, Bible classes, and factory meetings with cookery classes. Anna Hierta-Retzius was a board-member of the Lars Hiertas Minne foundation which, amongst other things, provided funds to women who worked in the sphere of social reforms. For example,  (Agnes Lagerstedt) was provided with the means to travel to England to visit Octavia Hill, and she subsequently established AB Stockholms Arbetarehem, which constructed affordable, proper housing for the working classes. In addition to her social reform activities Anna Hierta-Retzius was also active in the bourgeois women’s movement. She was encouraged by her father to set up the Förening för gift kvinnas äganderätt (married women’s property rights association) in 1873, the first Swedish organisation which supported women’s rights. Lars Hierta had put forward parliamentary motions in the 1850s on questions relating to married women’s property rights and the association took that one step further. It served as a lobbying organisation for both men and women, to influence parliament to give married women the possibility to decide on their own wealth and their own incomes. 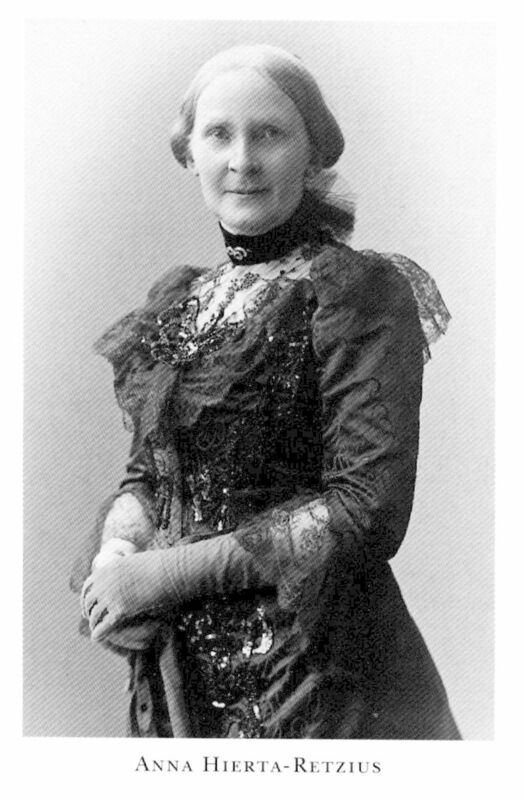 The association lost ground to the Fredrika-Bremer-Förbund (society) which was set up in 1884 under  (Sophie Adlersparre)’s leadership. Anna Hierta-Retzius was critical of the Fredrika-Bremer-Förbund as she felt it was far too conservative given that its leadership were inclined to right-wing politics. Her association continued for a little while but was eventually merged into the Fredrika-Bremer-Förbund and became the latter’s committee for legal matters. From 1900 onwards Anna Hierta-Retzius was focused on women’s issues. She was active in Svenska kvinnors nationalförbund (national council of Swedish women), which was an umbrella organisation for a broad-spectrum of women’s associations, mainly those involving the middle-classes and common folk. The council focused on generating connections with sister organisations in other countries in order to share experiences and dealt with issues such as the legal rights of married women, women’s rights to education and to access middle-class professions. Some of these issues also involved national matters. For example, a campaign was organised to generate a parliamentary motion on a female labour inspectorate. Anna Hierta-Retzius worked alongside the corresponding international organisation called The International Council of Women. Anna Hierta-Retzius and her husband Gustaf Retzius came to form a very close relationship. In conjunction with the marriage the Hierta family financed a professorship for Gustaf Retzius at the Karolinska Institute. It was thanks to his wife’s wealth that he could work as an independent researcher. She also accompanied her husband on his travels to international conferences and adapted her own lifestyle to accommodate her husband’s field research during the summer months, largely in Fiskebäckskil on Sweden’s west coast. During the 1890s she hosted a major salon in her home to which the most prominent intellectuals, cultural celebrities and scientific experts of the era were invited. This was a boon to her husband’s career. The close relationship between the married couple eventually led to an increased distancing between them and their friends and family. This was also intensified by the couple’s increasingly conservative political stance. Anna Hierta-Retzius ideology was based in the radical liberalism of the mid-1800s. Towards the end of that century new progressive approaches arose and the Hierta-Retzius couple adopted an increasingly conservative position. This change began when the couple started to read Aftonbladet in the 1880s. In response to the ongoing morality debate of the time they adopted a conservative position and took a right-wing approach to women’s issues. Anna Hierta-Retzius altered her view on married women’s rights to control their own income and wealth and in 1912 she distanced herself from the calls for women’s suffrage. Despite this turn of events her significance within philanthropic and women’s rights spheres should not be diminished. During the second half of the 1800s she contributed to the modernisation of types of support and assistance available to the poor and set up institutions which underwent further development within the welfare society of the 1900s. Her contribution to the middle-class women’s movement around the turn of the twentieth century must not be overlooked either. Anna Hierta-Retzius died in 1924. Anna Wilhelmina Hierta-Retzius, www.skbl.se/sv/artikel/AnnaHiertaRetzius, Svenskt kvinnobiografiskt lexikon (article by Kerstin Norlander), retrieved 2019-04-22.